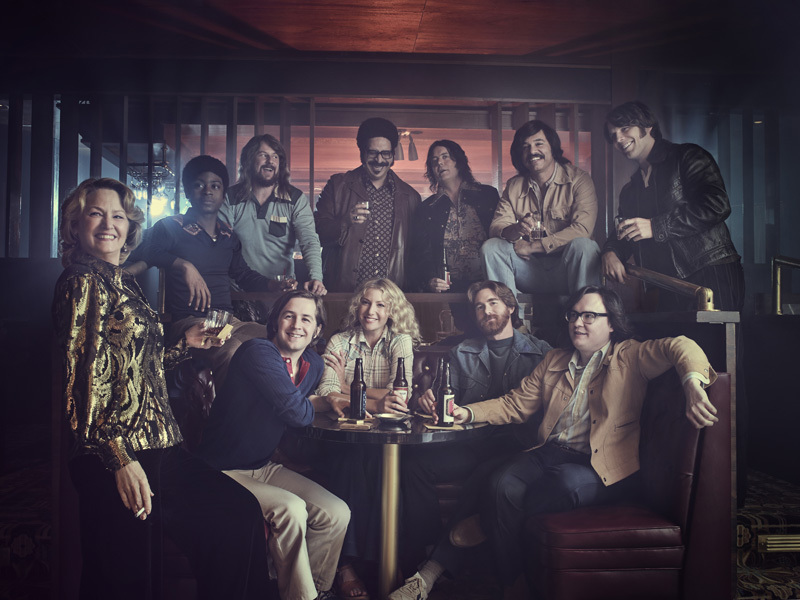 Showtime will present the world premiere of its new one-hour drama series I’m Dying Up Here at the South by Southwest (SXSW) Film Festival on Wednesday, March 15 at 11:30 a.m. in the Paramount Theatre in Austin, Texas. The world premiere will be immediately followed by a Q&A with the series’ cast and producers, including Academy Award winner Melissa Leo (The Fighter, Treme), Ari Graynor (Bad Teacher), Andrew Santino (Mixology), Erik Griffin (Workaholics), Al Madrigal (The Daily Show) and executive producer Michael Aguilar. Check out the first photo in the gallery below! That same afternoon and evening, Showtime will offer SXSW badge holders an I’m Dying Up Here experience at The Showtime House at Clive Bar on Rainey Street. The musical lineup will feature performances by LA-based artists, including Bleached, The Relationship (feat. Brian Bell of Weezer) and The Wild Reeds, and will be headlined by Nick Waterhouse and a ‘70s DJ set by Grandmaster Flash. The evening event will also be hosted by I’m Dying Up Here stars Leo, Graynor, Madrigal, Santino and Griffin. Showtime will also present a special Twin Peaks experience at The Showtime House on Thursday, March 16 and Friday, March 17. For the fifth consecutive year, the impact of the Showtime brand will be experienced through its official sponsorship of the multiplatform SXSW GO app, as well as the Festival’s shuttles and official canvas tote bag. Festival goers will be able to hop aboard an I’m Dying Up Here-branded bus, which will shuttle them from the Austin Convention Center to venues throughout the city for the duration of SXSW. The official SXSW GO mobile app, presented by Showtime, allows attendees to view, plan and share their schedule, network with others and navigate the convention on the ground. Platinum SXSW badge holders will also receive Showtime branded tote bags when they pick up their festival badges. The new one-hour drama series I’m Dying Up Here kicks off the network’s summer lineup and will premiere on Showtime on Sunday, June 4 at 10 p.m. ET/PT. The fictional series explores L.A.’s famed ‘70s stand-up comedy scene where the careers of legends such as David Letterman, Jay Leno and Richard Pryor were launched. The series delves into the inspired, damaged and complicated psyches of those who stand alone in front of an audience “dying” for fame, fortune and, with any luck, a shot on Johnny Carson. 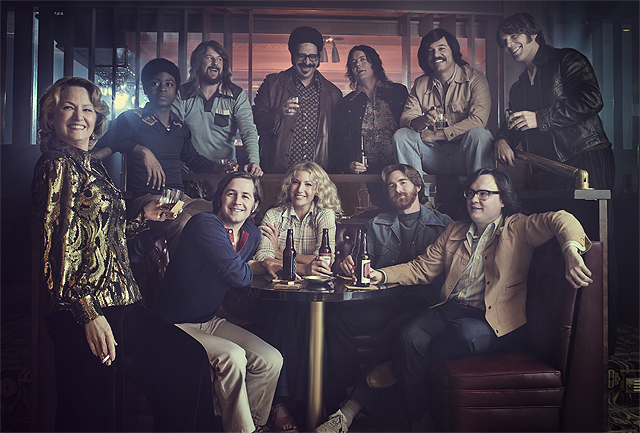 I’m Dying Up Here stars Melissa Leo, Ari Graynor,Michael Angarano (“The Knick”), Clark Duke (Hot Tub Time Machine), Andrew Santino, Erik Griffin, RJ Cyler (Me and Earl and the Dying Girl), Al Madrigal and Jake Lacy (Obvious Child) as part of a large ensemble cast. This fictional group of competitive but close-knit comedians is mentored by “Goldie” (Leo), a brassy comedy club owner who rules over her business with an iron fist, but nurtures her comedians with tough love. For Goldie and her crew, there’s truly no such thing as an easy laugh. Recurring guest stars include Stephen Guarino (Happy Endings), Brianne Howey (Horrible Bosses 2), Jon Daly (Kroll Show), and Ginger Gonzaga (Togetherness). Guest stars include Emmy nominee Dylan Baker (The Good Wife), Oscar nominee Robert Forster (Jackie Brown), Oscar nominee Cathy Moriarty (Raging Bull), Emmy nominee Alfred Molina (Chocolat) and Sebastian Stan (Captain America: The Winter Soldier, The Martian). Produced by Showtime, I’m Dying Up Here is created and executive produced by Dave Flebotte, and executive produced by Michael Aguilar and Golden Globe winner Jim Carrey, along with Christina Wayne for Endemol Shine Studios and Assembly Entertainment. The series is based on the non-fiction book of the same name by William Knoedelseder. The pilot was written by Flebotte and directed by Jonathan Levine.